Inventors help solve vexing problems, both sophisticated and simple, and as a result sometimes enjoy considerable celebrity and rewards. Our society’s economic success, too, is based on innovation. To encourage public disclosure of inventions, the U.S. Patent and Trademark Office (USPTO) issues an inventor a patent, which excludes others from making, using, selling or importing that invention into U.S. territories for a limited period of time. The three kinds of U.S. patents cover living plants, ornamental designs and useful inventions (the latter are called “utility” patents). Familiar products once protected by U.S. utility patents include Alexander Graham Bell’s “improvement in telegraphy” (the telephone), the Wright brothers’ “flying machine” and Thomas Edison’s “incandescent lamp” (the light bulb). This article provides valuators such as CPA/ABVs with a set of basic procedures for valuing U.S. utility patents. Patents are intellectual property (IP) that may need to be appraised for accounting, tax, litigation and transactional purposes in situations that include divorce or bankruptcy actions, estate settlements, sales of businesses and company mergers (which might require valuing portfolios of inventions). The ability to appraise patents can be important for GAAP financial reporting purposes under FASB nos. 141 and 142, especially for auditors and valuators in high-tech industries in which there are lots of business combinations. An understanding of how to appraise patents also may be useful in expert witness engagements. 13. Analyze any prior royalties paid for the patent. To develop a value for a patent as of a certain date, the CPA/ABV should note any prior royalties paid for the patent and look for differences in context from the previous to current time and analyze and explain them. The often cited patent infringement case Georgia-Pacific Corp. v. United States Plywood Corp. (318 FSupp 1116 (SD NY 1970)) lists 15 factors useful in analyzing royalties, among which are factor 5, the commercial relationship between the licensor and licensee, and factor 13, the realizable profit that should be credited to the invention. Other factors may affect royalties, too. They include the remaining costs and risks of prototype development, whether the licensee or the licensor is to bear them and whether the licensee or the licensor is likely to benefit from or to be burdened by related patent litigation. Third, if both MR and MC curves can be determined for a patent, it’s possible to show the price at which certain quantities are likely to be sold. 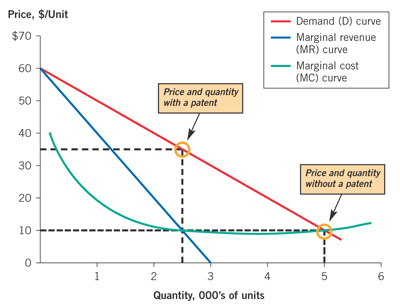 For example, the profit-maximizing price with a patent is shown by the point on the D curve directly above the intersection point of the MR and MC curves. Thus, with a patent, ABC Corp. might be able to sell 2,500 widgets at $35 each. Without a patent, however, competitive pressures will push the price down to $10 a widget (where the D and MC curves intersect)—but at that low price total demand will expand to 5,000 widgets. To calculate the potential incremental income or profit contribution to be derived from a patent, it helps if CPA/ABVs consider the price advantage or premium associated with the sale of the patented product and/or cost savings associated with the patent’s use. Cost-savings investigations seek answers to the question: How much money would a prospective licensor save by using the patented product? Price premium investigations involve finding the price point for profit maximization. Typically, a negotiated royalty rate will be lower than the projected total economic profit contribution from a patent to provide economic incentives for both licensor and licensee.